Quiltville's Quips & Snips!! : A Bow-Dacious Mother & Daughter Day! How fun is it when Mother & Daughter teams make big plans to spend the New Year’s holiday together sewing away and sharing not only their fabric, but their love of quilting! Yesterday’s Bow-Dacious class at Fabric Fanatics in Plano brought together THREE Mother/Daughter teams and the conversations and interaction were so much fun! For some reason, these three pairs all found themselves at the same row of tables in class! I love knowing who started quilting first, and finding out a little bit about each pair. I learned to sew basic things from my mom, but quilting never really entered the picture for me until I was off and married. My mom has only picked up quilting in the last 7 years or so. I have not been able to attend any quilty events with her as yet, so I was a bit jealous as well as joyful over these Mom & Daughter duos making holiday memories together. Nell & Loretta from Nebraska! Pearl & Annette from Texas! Quilting is the thread the binds! 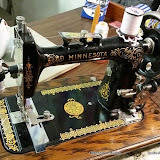 Allison’s Lovely Minnesota hand crank! Bow-Dacious is found in my book Adventures with Leaders & Enders and is featured on the cover. This is definitely not a quilt that anyone was going to get done in a day, and students had their choice of working either with pre-cut squares from their own Scrap User’s System or, work with short strip sets to build the variety in their 4 patches quickly. We also know that there are many other projects that will pull and tug over us during the coming year, so a good solution to keep moving on this one, is to use the pieces as Leaders & Enders, making units and blocks between the lines of chain piecing other things. I can’t wait to come back next year and see some completed quilts! Irene…such a cheesy happy smile! Allison --One down, 40 bazillion to go!! How I spent New Year’s Eve! Tom Hanks/ Meg Ryan Movie-thon with Irene! I’m using Allison’s lovely 301 and working on my mini bear paw units! We made it through You’ve Got Mail and Sleepless in Seattle before the ball dropped! Whole lotta piecing going on! So, what’s up for your 2015, Day TWO? I hope it’s a good one whatever you get up to! As for me, we’ve got a Scrap Crystals workshop starting soon, and our classroom will be filled with 31 happy scrappy quilters! Loving those mini bear paws. I am a non-hereditary quilter so I can't share my passion with my mom, though my folks are very supportive of my quilt art and love anything & everything I make. Has your mom ever thought of joining the workshops you are teaching? I'm sure there are guilds & shops out there hosting that wouldn't mind your mom tagging along. Maybe you could add a "one guest quilter allowed" clause to your contract! And then, you could offer some of those spots up for auction to benefit a quilty charity to your readers/followers/Bonniacs. Just a thought... Thanks for another fabulous mystery! Time to plan which Bonnie quilt I am making next. I like how the bow tie is sort of hidden in the blocks. I would call it a block within a block! Thank you for sharing. I am continuing to purge and clean out. I challenged my husband and I to find something in all the Christmas decoration bins that we could get rid of this year. We found three things to donate. I didn't mean for my comment to be posted as anonymous. That being said, can someone tell me the name of the quilt at the top of the page and the book I can find it in? P.S. Being part of this group makes me HAPPY! Pam, if you go to the Free Patterns tab at the top of the blog, I think you will recognize the quilt if you scroll down on that page to the Split 9-Patch. It was originally presented as a leader-ender challenge in 2013. It's free!! Thank you, Bonnie! I see you are working on your sweet little borrowed machine. I am dying to know about the LED light she also included with all of the other goodies for you to use. What brand is it? Do you like it? And where can we get one if we want one? Inquiring minds need to know. Looks like you're all having a great time. Loretta from Nebraska looks so familiar to me. I wonder what her last name is(Daniels maybe?) and if she ever lived in the Page/Orchard area. She and her daughter must be great Bonnie fans to make the trip all the way from Valentine. Ha!! I watched those same movies plus Mrs. Doubtfire while sewing on my Grand Illusion on New Year's Day while hubby was watching college football! I love the bear paw...can't wait until the book comes out to do that one, hopefully by then I can get some ufo's done. Love all the pictures! Great sewing. Also love, love the green 301. A painted 301 and 221 are on my want list! Continue success with classes.